Rob's Blog — Suburban legends. 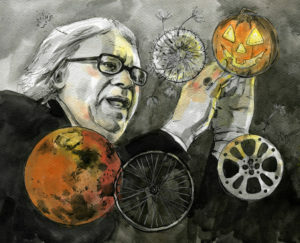 The day before Halloween some years ago, Ray Bradbury was appearing at a Los Angeles public library to drum up support for the institution–to remind people of the library, and its importance, and the books there for the asking. I found out about the event on short notice, and sped north from San Diego. First miracle: a parking space only a block or two away, and I crept back through dark suburban streets to the little branch library, now buzzing with an after-hours crowd. My heart fell as I saw how full the place was. Second miracle: a seat, first row, but way off to one side. Far from the podium. But if I craned my neck, I’d be able to see the speaker. There was a small table in front of me, way over on stage left, with a lit jack-o’-lantern on it. Nice of the library staff to provide some atmosphere. It was a while before things got organized, but eventually the room packed full, and a hush fell, and Ray was invited to the podium. There was a quick discussion between his assistant and the MC, and Ray rolled over in his chair and stopped a few feet from me. The podium wasn’t wheelchair-friendly, you see. He’d be more comfortable seated. Ray began spinning his stories of how he became a writer, of educating himself in libraries, of typing Fahrenheit 451 on a rented typewriter at UCLA using $9.80 in dimes over nine days. And then the lights went out. Library staff scuttled around in the dark, then apologized: the lights wouldn’t be coming back, but they’d let the talk continue if nobody minded. Ray didn’t miss a beat. In the faint glow of the jack-o’-lantern, he seemed to talk directly to me and the people to either side. We were probably the only people Ray could see. 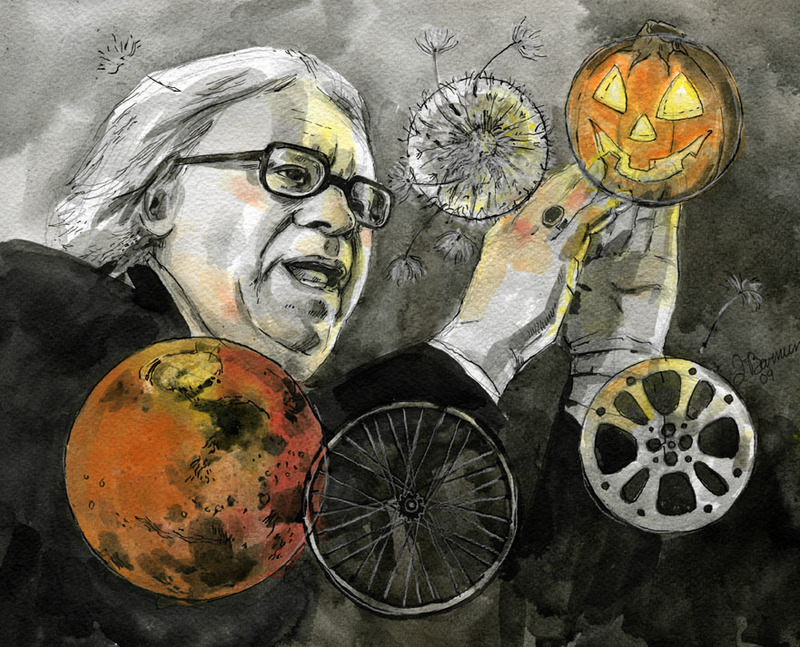 For more than an hour, I felt I had a private audience with Ray Bradbury, listening as he told his tales, conspiring over a pumpkin, watching as the Halloween candlelight played over his face and fired our imaginations. I grew up watching Star Trek with my parents, and it played a particular role in bonding with my father. A 10th-grade dropout, a mechanic, a contractor and engineer with little regard for standards, measurements, or straight lines–nonetheless, my father was fascinated by the ideas in the show. Long after we’d watch a rerun of the original series, he’d want to talk about the Big Ideas coded into the adventure of the week. Working under a car, he’d muse how unlikely it was that we were alone in the universe, or urge that humanity needed to get out there, if only so we spread out and increased our chance of survival. The show made a philosopher out of a high school dropout who never read a book in his adult life. 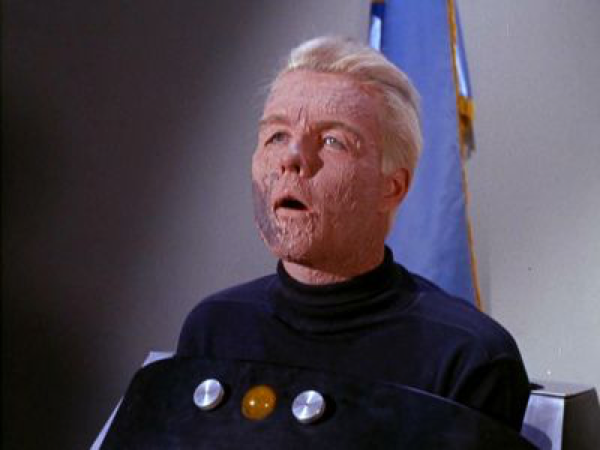 This is Captain Christopher Pike, confined to a wheelchair after being horribly burned by radiation. He’s only able to communicate by beeping: once for ‘yes’, twice for ‘no’. (I know–oddly retarded technology for 300 years in the future, but whatever). My father and I watched Pike, in the first-season episode The Menagerie, reduced to cryptic yes/no signals. Beep. Beeeep Beeeeeeep. Thirty years later, a doctor called to tell me they’d tried everything they could think of, but my father wasn’t coming out of the coma they’d induced. Ever. It should have been routine, like waking from sleep, I was told. Which is why I’d left his side. Which is why I was three thousand miles away when things went inexplicably and permanently bad. The doctor wanted instructions. In the background, I heard the life support machines. Beep. Beeeep Beeeeeeep. I didn’t hesitate. The doctor was kind enough to put the phone to my father’s ear, and I spoke to him while the tones of the machinery lengthened, became steady, then were shut off. Sometimes Star Trek gets things wrong. There *are* no-win scenarios. But because of the show and its ability to fire imagination, I knew exactly what to do, and was equipped with the resolve needed in that moment. I couldn’t turn death into a fighting chance to live, but I could honor a final request and do it without flinching. Drew a small crowd at the recreation of Flynn’s Arcade from the movie. 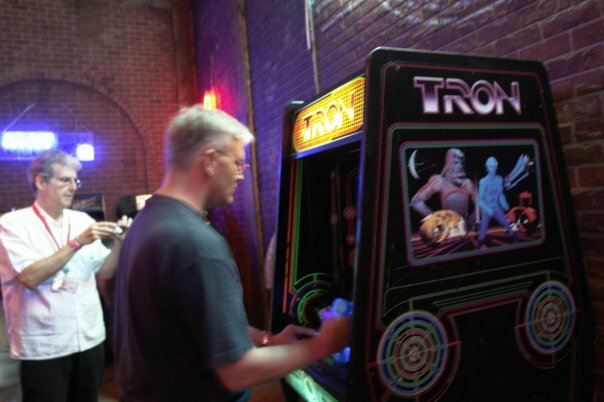 In 1982 I was world champion at Tron for about 2 weeks…name printed in Electronic Games magazine, etc. My score still ranks #15 or #16 in history. Later, this image appeared on CNN in an article about “Top 10 things we saw at Comic-Con this year.” The back of my head is famous. Nothing made me feel so awesome as people spotting me in the ‘Ambush’ costume, calling out ‘Rob! I heard you were coming back!’ and running up to hug me. I didn’t know how much I missed this community–until I was welcomed back. Also, there’s a dragon. 1909 footage digitally restored in 2014.